The chart above may be a touch hard to read, but it is important. 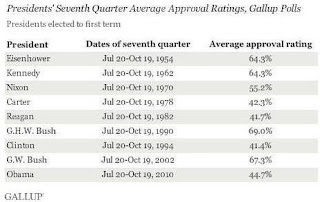 It is a compilation of approval ratings for US Presidents from July-October of their second year in office - right before the midterms. As you can see, some presidents were soaring pretty high at this point (Eisenhower, Kennedy, both Bushes), but look closely at both Presidents Reagan and Clinton. Both had lower approval approval ratings at this mark than President Obama has now. Here's why this is significant. The media driven narrative this year is that Obama is at an unprecedented low in approval, that he is a drag on Democrats running for office this year, and that he may not be electable in 2012. Yet, Ronald Reagan was at a lower point in 1982. His approval was lower than that of his predecessor at the same time, and unemployment was at an unbelievable 10.8% (much higher than the current level). Reagan was considered a failed president after the midterms due to losses by Republicans in the House and Senate (the Senate changed party control that year). Reagan, through the power of his personality and the loyalty of the Republican Party, was able to recover by 1984 and win re-election by one of the largest margins in history. There are a myriad of similarities between 1982 and 2010. Most media pundits compare the current year to the 1994 midterms when President Clinton, with a 41% approval rating and 5.8% unemployment, was held responsible for the Democrats' loss of control of both the House and Senate. He, too, rebounded and won re-election in 1996 by a wider margin than he did in 1992. 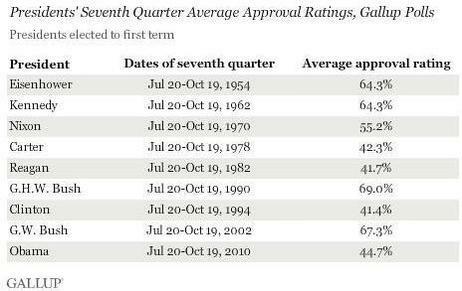 After his partisan impeachment in 1998, Clinton's approval remained in the sixties through the end of his term. Is Obama finished? Of course not. He does suffer from some disadvantages that Reagan did not. The left's opposition to Reagan was not nearly as personal, nasty, dishonest, and vitriolic as the right's scorched earth treatment of Obama (see birthers, Glenn Beck, teabaggers, etc). Add that to the utter disorganization and disloyalty of the Democratic members of Congress who appear to care about little more than their own re-election. They refuse to tout the legislative achievements of the party, and allow the opposition to define the terms of all debate on the issues. Having said that, there is still plenty of time to turn it around. Plenty of time. I imagine that many of the conservative, "blue dog" Democrats are the ones who will lose re-election this year. They are the ones who most openly criticize Speaker Pelosi and Pres. Obama, voted against health care reform and Wall St reform, and voted against the stimulus. They will lose because they did nothing. Literally. They sat back, like the Republicans, and hoped for failure. Is it any wonder that Democrats in their districts are not enthused?! What is the difference between a "no" vote from a blue dog and a "no" vote from a Republican? Nothing. Many conservative Dems rode the Obama wave in 2008 to victory, only to abandon him as soon as they got to Washington. I say, "good riddance." Without many of the blue dogs weighing them down, the Democrats will be able to focus more on their agenda, and less on one-sided compromises with the Republicans. If the GOP does take control of Congress, the Dems must utilize every opportunity to point out all of the shady legislative tricks that the party employs, and their hypocrisy when they utilize tactics they criticized when done by Democrats. Throughout President Obama's political career he has been a closer. He is a far better fourth quarter player than first or second. We all witnessed this in both the fight over the Democratic nomination and in the general election of 2008. So, enough of the hand-wringing, people! Historically, nearly every president loses seats in the midterms. Approval ratings are only a snapshot of a moment in time. They are not fixed or set in stone. I think President Obama has learned that there is no bi-partisanship left in Washington, and will (finally) employ a more combative posture with the obstructionist GOP. It ain't over til it's over, friends. Vote on November 2, even if you are not "enthused." We cannot go back to the policies of the Republican Tea Party that brought the country to its worst economic point since the Great Depression. They have absolutely no new ideas, and are banking on unenthusiastic Democrats and the seeming amnesia of independent voters. Whatever happens in November 2010 will have little bearing on November 2012. Remember that. George H.W. Bush had a 69% approval rating at the midterm point, and he lost. I was pointing this out to my wife during the past few days when we were watching CBS Evening News. She asked "How did Obama get so unpopular?" I told her something along the lines of "He's not unpopular. The shouters are only saying so, repeatedly, to make America think he isn't popular. His approval ratings are around the 45% mark, which isn't great, but when nearly every other American thinks the president is doing a satisfactory job, you can't really call that "unpopular"." Her response was "Really? Wow! What a bunch of liars!" My response was "Yep. They'll do and say whatever it takes." Good old "liberal media" CBS... they didn't mention that Obama's rating is higher than Carter, Reagan or Clinton were at their first midterm times. When a network as big as CBS buys into this kind of stuff, it suggests to me 1) CBS lacks integrity and/or it is lazy, 2) CBS is not "liberal" at all because it (wittingly or unwittingly) plays into the hands of the right wing's propagandists, and 3) by being as vocal and persistent as they have been, the right wing shouters are having great influence... far too much, in my opinion. I would also suggest that while the Dems may lose the House and may lose seats in the Senate this November, it doesn't mean much about how Obama could do in a run for re-election. All those people who will be newly elected to House seats must remember it is THEY who will be incumbents in 2012. And who will the GOP run in 2012, Sarah Palin? Even if Americans are dissatisfied with Obama at that point, would they actually choose Palin instead? She would have a lot of work to do in order to try and appear presidential to enough Americans to get herself elected, and two years of hard work might not be enough to accomplish that, unless the right wing media can further brainwash the country by then. Thanks to corporate media the Right always enjoys the larger megaphone in public discourse. And speaking of disproportional voices, the polls are reflective of land line phone owners, who are mostly older and conservative compared to younger more liberal cell phone only users. I bet the Dems retain both houses. That is a good point about the cell phones, and I hope it makes a difference this year. But that notion was mentioned in 2008, yet the election results were remarkably similar to the pre-election polling. Dave, despite Obama's approval rating, his negatives on a disapproval rating really tell the story of why he is in deep trouble. Further, Reagan's policies hadn't fully kicked in yet by his first mid-terms but people could see that he was trying. Obama's unpopular policies have been enacted and are set to balloon our debt and problems by gargantuan proportions. Indeed, they already have done so. Further, the actual unemployment number currently is closer to 17.6%because so many folks have quit searching for jobs. Therein lies the difference between Reagan and Obama there. I have heard this hopeful narrative of Reagan / Obama comparison and it is nothing more than progressives trying to cling to false "hope and change". While anything is possible, I would be willing to bet $100 to the candidate of your choice in 2014 vs. a similar check from you to a candidate of my choosing that Obama will not be re-elected in 2012. His only chance is to move dramatically to the center, and he is rigidly ideological and incapable of doing so. He will fail and history in twenty years will place him near the bottom of presidential administrations along with Carter and Hoover. W. Bush will even be higher than he will be, I predict, albeit not much higher. Reagan's policies hadn't kicked in yet, but Obama's have? Hardly the case. What was the "actual" unemployment number in 1982? You came up with an Obama number awful quick, yet no research on the Gipper? Most of Obama's signature initiatives have not even started (like health care for example). The parallels between 82 and 2010 are pretty obvious, and seem to only not be seen by the right. Reagan had a rough two years despite having control of the Senate. Reagan was very unpopular at the midterms and the GOP lost seats in the election. Pundits of the time were certain that he could not be re-elected, and many Republicans had serious buyer's remorse about going with Reagan instead of a more moderate candidate. Reagan did turn things around. To believe Obama could not do the same thing is to be avoiding the obvious. He is personally more popular than any nationally known, elected official in America, and there is no Republican as of now who could beat him. Name one. Palin? Huckabee? Romney? Not bloody likely. Obama has been firmly in the center the last two years, and has wasted valuable political capital and time compromising with Republicans. It got him no support. Your idea of "center" seems to be somewhere near Jim DeMint. News flash: he's the extreme, Obama is the moderate. I will take that bet, btw. I can never pass up a bet that safe.